1. Preheat oven to 325 degrees F (300 degrees F with convection) and spray a 8×8 glass dish with non-stick. 2. Put 4 cups of bread in the dish. 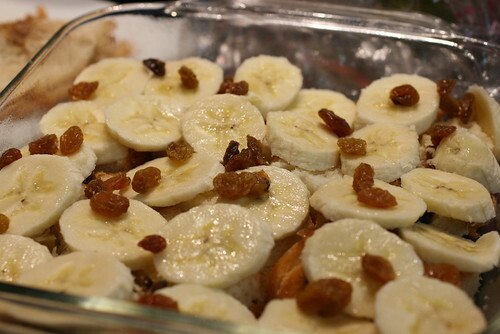 Arrange bananas in one layer and sprinkle with raisins. Arrange the remaining bread on top. 3. Whisk together eggs, half and half, white sugar, vanilla extract, and cinnamon. Pour over the bread and bananas. Using your fingers, press down on the wet bread mixture. 4. 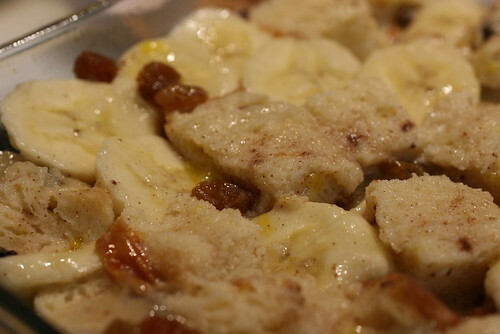 Bake for 50 minutes or until the bread pudding is set. 5. You can serve warm or room temperature. 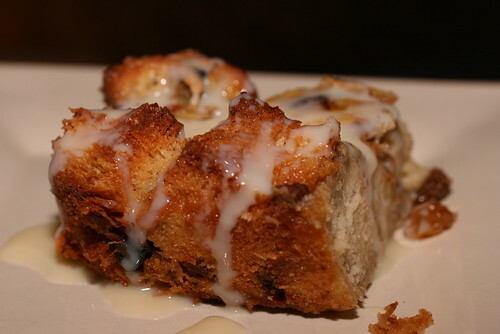 Drizzle with condensed milk. 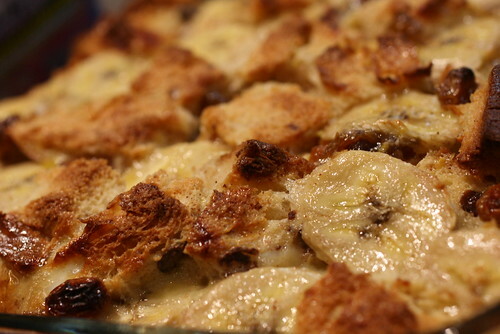 The fresh banana flavor really comes through and since bread pudding is really pretty much the same as French Toast, feel free to have it for breakfast too. posted by jessica	at 10:06 AM	Filed under Desserts, Recipes. You can follow any responses to this entry through the RSS 2.0 feed. Both comments and pings are currently closed. Manger la ville, I’ve never had a savory bread pudding. I’ll add that to my list of things to try. The Davis’, thanks, I don’t like wasting anything. Grace, it’s like good karma for not wasting.